Some unforeseen estate issues, mainly our mother’s gargantuan unpaid taxes that we didn’t know about and suddenly owe, have come up. I don’t know how much money I have; I only know that I owe money, not how much, so I’m sitting tight, not taking any trips, not going to any writer’s doings, and not buying anything other than necessities until I find out. I’m in limbo. I feel like I’m in stasis and there’s nothing I can do about it, so I need to get comfortable with that. At least I’m writing. A lot. Being in limbo is an opportunity to learn to surrender and just wait. Cats are very good at this, by the way. I passed this one’s window on an afternoon walk. 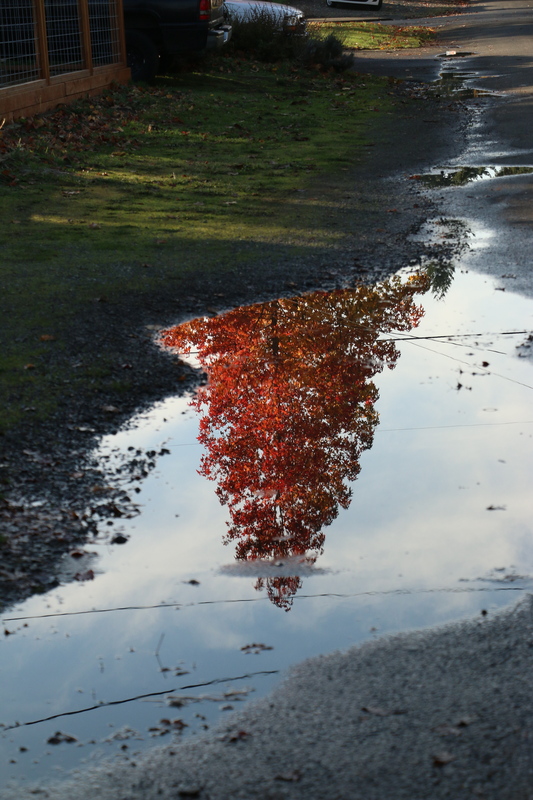 I’m going to focus on the things I love that are free–writing, taking my dogs for long walks and noticing things on those walks like the cat in the window and cool reflections in street puddles. Maybe I’ll even get around to decluttering my basement. 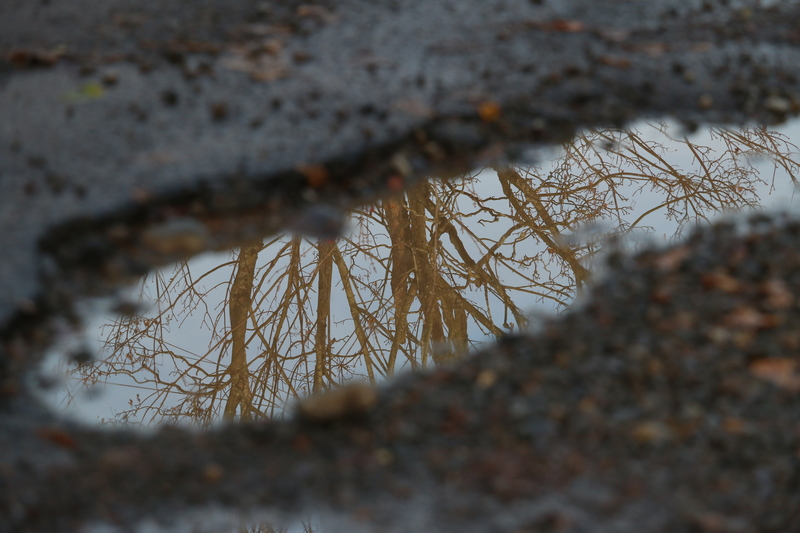 Tags: cats, Estate issues, Limbo, photography, Puddles, Reflections, Stasis, Taxes | Permalink. Thanks, Kelly. There are so many good things, and situations like these remind us to stop and focus on them. Time is a gift – time to reflect, think, ponder, walk, write – these are meaningful. I’m sorry about the taxes (that’s not a fun way for the $ to go). I know you got a new camera a while ago – what kind is it and can you share some tips on how you manage to be observant and take great pictures while also walking the dogs? 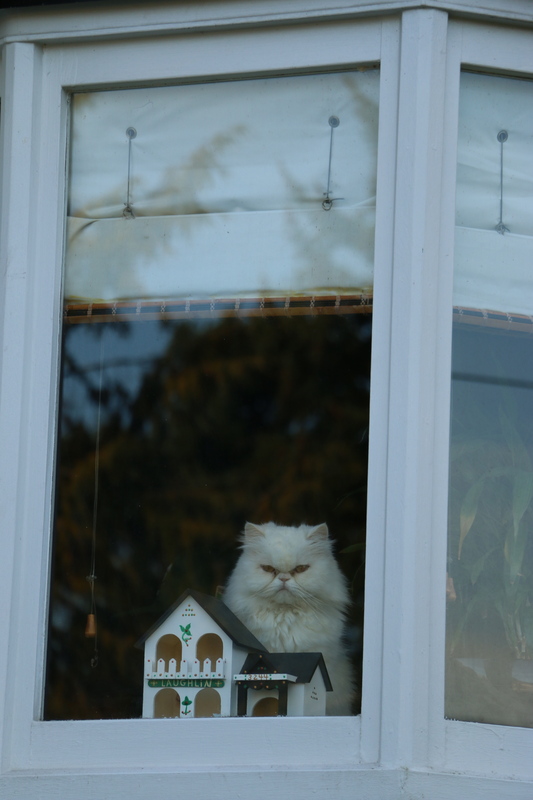 Love that cat in the window – what a face! Thanks, Janet! I got a Canon 70D. For me, the secret to being observant is to have a camera with me. When I have a camera, I notice things. It keeps me in the present moment and losing myself in photography was a huge help after my mom’s death. The dogs are used to it by now, LOL! When I walk both of them together, I bring a pocket camera, not the big one. I’m still learning (and that goes for every part of my life, not just photography)! Hope you’re doing okay; it’s close to a year since I lost my mom, and I know how hard it is.